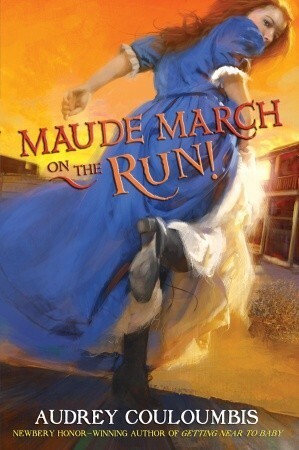 Book Review: Maude March on the Run! Another rip-roaring adventure in the Wild West with Maude March and her little sister, Sallie. They are on the run from the law again, in a series of misunderstandings that leaves Maude accused not only of bank-robbery but of murder. Reports come in from all over the West, claiming Maude has committed crimes in Texas, Kansas, and as far away as the Dakotas while she was nowhere near those states. Sallie and Maude disguise themselves as boys and set out for the Colorado Territory, where they hope to meet up with their Uncle Arlen. Along the way, they have adventures, narrowly avoid the posses tracking them, and make a few friends in unlikely places. I loved this sequel to the “Misadventures of Maude March”! The story is told from Sallie’s point of view, and she has some witty commentary about all the crazy situations she and her sister fall into. The dialogue is snappy and funny, and the characters have a lot of depth and development. There is not a boring moment in this entire book! The plot moves quickly from adventure to adventure, with some mystery and suspense to spice things up in between. I could barely put it down!